Our Day of the Dead dioramas show miniature skeleton scenes behind glass. 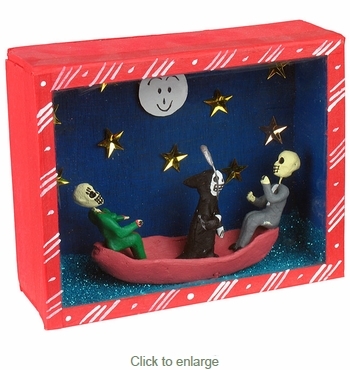 These festive scenes are created with clay and hand painted by Mexican folk artists. They are encased in a wooden painted box with a glass cover. They are a perfect addition to your Dia de los Muertos display.